At the Conservative Party Conference in Birmingham George Osborne announced his abandonment of fiscal rules. Instead, he will establish an "arms length" quango to monitor public borrowing and debt, and blow the whistle if the situation looks like it might be unsustainable. Unfortunately, that will do little for taxpayers, because it says nothing about cutting taxes: indeed, the primacy given to debt management means taxes could easily increase (eg see this blog). And as we've blogged many times, without clearly enunciated rules, politicians always find it easier to increase spending rather than cutting it. Of course, we can all see why Mr Osborne doesn't want to tie himself to upfront rules. As he said in his speech, Labour has done it again bigtime, leaving a toxic legacy of maxxed credit cards, rampant borrowing, and an economy on its knees. It's a mess and nobody would start from here. But somehow, we have to find our way out. And without early tax cuts, the way is going to be a lot longer and a lot stonier. Mssrs Cameron and Osborne often talk about tax cuts as if they're handing out lollies. "I'd like to give you some of your money back," says Mr Cameron, "I really would. But I'm a fiscal conservative, and mending that leaking fiscal roof must come first." In that world, tax cutters get painted as reckless swivel-eyes who don't care about the rain pouring through the roof - just as mad in their own way as spendaholic Brown. But tax cuts aren't just about handing out lollies. They aren't even just about the moral case for letting "hard working families" keep the money they've sweated for. They are about improving incentives, getting the economy back up off its sick bed, and earning our way back to fiscal health. Let's remind ourselves of Two Key Points. First, there is now a stack of evidence that says lower taxes mean higher growth. The TaxPayers' Alliance has a handy summary of the research here (Appendix). Overall, it says that a sustained one percentage point reduction in government's share of national income can be expected to lift trend GDP growth by around 0.1% pa. Which may not sound much, but it's cumulative, so over a decade, a sustained one percentage point reduction in government's share would be expected to lift the level of GDP by about 1%. (Put the other way, it means that Labour's public spending splurge since 2000 has already depressed our trend GDP growth rate by around ¾% pa - see TPA paper). Second, there is another stack of evidence that says higher growth improves the public finances. "A 1 per cent increase in output relative to trend is estimated after two years to reduce the ratio of public sector net borrowing to GDP - the Government’s preferred measure of assessing fiscal stance - by just under ¾ percentage point. About two thirds of the overall effect derives from the change in the ratio of expenditure to GDP." Got those Two Key Points? See where this is going? Lower taxes mean higher growth. And higher growth means lower government borrowing, not just through increased tax revenues, but also via lower spending on social security etc. So if we cut taxes we can look forward not only to higher growth, but also an improvement in our dire fiscal position. Ah, but, you hrrumph, the numbers don't add up. If we cut taxes by say 1% of GDP, growth would only increase by 0.1% pa. And on that basis it would take nearly fifteen years for GDP to grow enough to fund the tax cut. Meanwhile, our fiscal deficit would be even higher than it already is, and our international creditors would call time long before we reached the Promised Land. Nice idea, but it simply can't be done. Which is pretty much the position of the Tory leadership. Along with - it must be said - HM Treasury, the bulk of the economics profession, and fiscal conservatives everywhere. Whether we like it or not, it is the orthodoxy, and is most unlikely to change anytime soon*. But does that mean we can't have tax cuts? Does that mean - as Cameron and Osborne like to suggest - we have to wait for some growth to come along so we can share it? What if there is no growth? What if the combined effects of Labour's tax increases and the credit crunch condemn us to a decade of stagnation, or worse? What then? There is of course an alternative - tax cuts funded by spending cuts. And as it happens, that is precisely the package offered by George Osborne in his speech. He promised to freeze Council Tax - ie cut it in real terms - and fund it through a cut in spending (viz axing our old friends the management consultants, and slashing public sector advertising - both excellent ideas blogged extensively on BOM). It's a start. But what we really need is a strategy. A strategy to make room for tax cuts by reversing Labour's public spending splurge. So how much do we actually need to cut spending? Our competitors provide the obvious benchmark. 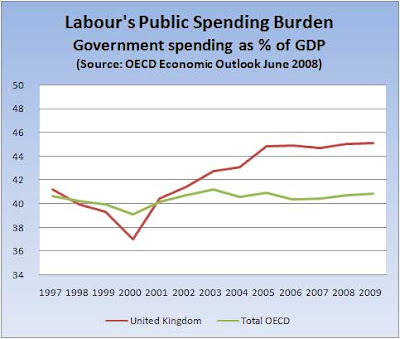 As the chart shows, Labour has taken us from a position of spending roughly in line with the OECD average, to one where we are spending roughly 10% above the average. Post-crunch, with economic stagnation, and India and China still advancing, that's a burden we just can't carry. So on that basis, we need a strategy to cut spending by 10% relative to GDP. Or in today's money, a cool £50bn pa.
Now, that's a huge pile of money, and nobody says it would be easy or quick. Indeed, Oliver Letwin even told us at the Conference that no government has ever succeeded in cutting spending (untrue - Callaghan did it in the late 70s, albeit with some assistance from the IMF). But if unfunded tax cuts are out, then what's the alternative? Nobody would start from here, but just hoping something turns up to get us growing again isn't much of a strategy. PS Yes, we do realise that the Tories' Plan for Change includes some other ideas for boosting growth, such as tax simplification - which we welcome - and "a new wave of dynamic supply side reforms to create a broader-based, dynamic economy that can withstand global shocks" (details TBC, but presumably not the same "dynamic supply side reforms" Labour always used to talk about). Neither are a substitute for lower taxes. *Footnote The time lag between a tax cut and any subsequent improvement in the fiscal position is of course right at the heart of the supply side/Laffer Curve arguments about self-funding tax cuts. And there is reason to think a lag of 15 years may be far too gloomy. For example, work carried out for the TPA by the Centre for Economic and Business Research suggests that a cut in Corporation Tax would be self-funding within as little as 8 years.